Wrote The Accidental Life: An Editor’s Notes on Writing and Writers, Alfred A. Knopf, 2016. Web and film development: co-created LitHub.com; co-created, produced Sport in America, HBO; produced feature documentary, Plimpton! Starring George Plimpton as Himself. Responsible for content of Sports Illustrated and 8 other magazines and websites, including Golf Magazine, Golf,com, FanNation.com, SI Latino, SI China and 13 SI Swimsuit editions. Total group print circulation: 6 MM; total audience: 30 MM. Total .com traffic: 25 MM UVs; 300 MM PVs. Launched first enhanced magazine on iPad. Integrated all print and digital content and delivery. Launched FanNation.com as community site compliment to SI.com. Launched the SI Vault — a complete digital archive of SI since 1954. National Magazine Award, 11 nominations. MPA Digital Award for Website of the Year, Entertainment & Sports, 2006, 2007, 2008. MPA Digital Awards Best Online Community (FanNation) 2007; Best Web Tool (mySI) 2007. 2012 inductee ASME Editors Hall of Fame. Responsible for content of SI, SI.com, SIKIDS, SIKIDS.com, SI Swimsuit. Developed SI.com; SI digital revenues up 180% in 2006; 587% over 3 years. Edited Frank DeFord, Gary Smith, Rick Reilly, Mitch Albom, Bud Shrake, Michael Lewis, Selena Roberts, Peter King, Dan Patrick, Karl Taro Greenfeld, Tom Verducci, Steve Rushin, William Nack, S.L. Price, John Ed Bradley, Leigh Montville, Walter Iooss Jr. Neil Leifer. Two National Magazine Awards, 8 nominations. Re-launched traditional entertainment fortnightly as a uniquely American weekly tabloid. Defined new “celebrity” category with “Fashion Police” and other editorial conceits. Forty percent circulation growth over 3 years. Repositioned and re-launched faltering men’s magazine — incorporating both literary journalism and health and fitness edit into adventure travel category. Edited Tom Wolfe, Kurt Vonnegut, Sebastian Junger, Carl Hiaasen, Jimmy Buffett, Roy Blount Jr., Rick Telander, Robert Kennedy Jr., Tony Hendra, Ian Frazier, Bruce McCall, Steve Bodio, Scott Anderson, Ed Gray, Mark Kram, Tom Conroy. Re-launched downscale “hook and bullet” magazine, returning to 107-year-old roots as an upscale “outdoors” lifestyle title. Three consecutive years of double-digit revenue growth. Launched Sports Afield Books (with Grove Atlantic). Edited Phil Caputo, Grits Gresham, Charles Gaines, Robert F. Jones, Ted Kerasote, Doug Peacock, Bruce Babbitt, Verlyn Klinkenborg, Rick Bass, Michael Segell, Thomas McIntyre, Guy Martin, Steve Chapple, Lionel Atwill, Geoffrey Norman. 2 National Magazine Award nominations. Returned men’s service title to its roots in literary fiction and long-form journalism. Conceptualized and launched Esquire Gentleman and Esquire Sportsman. Launched Esquire Books (with Grove Atlantic). Edited Norman Mailer, John LeCarre, John Gregory Dunn, Gay Talese, Richard Ben Cramer, James Salter, Richard Ford, Cormac McCarthy, Ken Auletta, Susan Minot, Tom Brokaw, Jimmy Breslin, William F. Buckley Jr., Bill Bradley, Mike Lupica, Robert Sam Ansen, Stanley Bing, John Berendt, Sherman Alexie, Peter Beard, John Sayles, Denis Johnson, Joy Williams, John Sack, Geraldine Brooks, Susan Orlean, Pete Hamill, John Edgar Wideman, Robert Towne, Bruce Wagner, Anthony Hayden Guest, Elizabeth Gilbert, Barry Hannah, Mark Leyner, Bill McKibben, Mickey Spillane, Tad Friend, Michael Musto, Richard Belzer, Barbara Kruger. Two National Magazine Awards, 10 nominations. Livingston Award ("Terminal Delinquents," by Jack Hitt and Paul Tough, Dec., 1990). One of Media Week’s Editors of the Year. Formed limited partnership, raised capital and launched men’s lifestyle, arts and literary title. Edited Jim Harrison, George Plimpton, Hunter S. Thompson, Rian Malan, Taki, Graydon Carter, Peter Maas, William Broyles Jr., Eve Babitz, Richard Stengel, Allan Gurganus, Jay McInerney, Norman Parkinson, Chee Perlman, William Wegman, Peter Collier, David Horowitz, Michael Segell, Loren Jenkins, Mario Testino, Elizabeth Kaye, Robert Ward, Tim Street-Porter. Sold to Owen Lipstein and Seiichi Hasume (JICC) for $2 million. Special consultant to Clay Felker. Responsible for “back of book” including media, medicine, science, lifestyle, education, etc. Assigned and edited first national cover on AIDS. Launched Newsweek Access — first “technology lifestyle” title (Wired came 10 years later). Edited Pete Axthelm, Jack Kroll, Jonathan Alter, Walter Shapiro, Jennett Conant, Vince Coppola, Ken Auchincloss, Jerry Adler, Mark Stevens, Peter Goldman, Michael Rogers, John Dvorak, Steven Levy, Tony Clifton, Annalyn Swan, Bob Rivard, Gary Trudeau, John Ashbery. 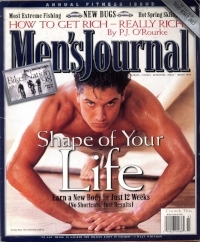 Doubled newsstand sales from 240,000 to 500,000. Edited John Irving, Larry McMurtry, P.J. O’Rourke, Ray Carver, Griel Marcus, Richard Price, Joe Klein, Kurt Loder, Scott Spencer, Jane Ann Phillips, Bruce Jay Friedman, Joe Esterhaus, Maryanne Vollers, John Bradshaw, Maureen Orth, Diane K. Shaw, Mark Jacobson, Timothy White, Ben Fong Torres, Chet Flippo, Paul Nelson, Donald Katz, Jonathan Cott, Jann Wenner. Conceptualized and launched first regional magazine for the Mountain West. Edited Peter Matthiessen, Edward Abbey, Ray Mungo, William Hjortsberg, Michael Moore, Robert Finigan, Molly Haskell, John Nichols, Leslie Marmon Silko, James Welsh. Edited Thomas McGuane, William Kittridge, James Crumley, Tim Cahill, Russell Chatham, E. Jean Carroll, Galen Rowell, Charles Bowden, Thomas Sanchez, Richard Braughtigan. Assigned and edited features; wrote cover stories at one of the first successful city magazines. Reported, researched, wrote and edited educational documentaries. Traveled extensively; covered “Black September” in Beirut, 1970. • The Accidental Life: Notes on Writing and Writers, Alfred A. Knopf, 2016. • Wyoming, poetry, Grove Press, 2010. • California Bloodstock, novel, Macmillan, 1980; Dell, 1984; Vintage Contemporaries, 1989. • Lust, Violence, Sin, Magic: Sixty Years of Esquire Fiction (introduction), Grove Press, 1993. • Hot Shots: 21st Century Sports Photography, (forward), SI Books, 2006. • Slide Show by Steve Hoffman, (introduction) SI Books, 2009. • Freelance credits include NY Times, Paris Review, Esquire, Harper’s Bazaar, Vogue, Towne & Country, Vanity Fair. • Sport in America, co-creator, producer, writer, HBO, 2014. • Plimpton! Starring George Plimpton as Himself, producer, 2013. • Saturday Night Live, played self (Managing Editor of Rolling Stone) in “Kill Your Landlord,” 1981. • Miami Vice, screenwriter, “Back in the World,” 1985; “Over the Line,” 1988. • China Beach, screenwriter, “Waiting for Beckett,” 1988. • Last Call, host, culture & politics talk show produced by Brandon Tartikoff, MCA, 26 weeks in major markets,1994. • SI Stories, executive producer, 10-part, 30-minute series based on SI journalism, ESPN, 1994. • Breakfast with Hunter, played self, feature documentary by Wayne Ewing, 2003. • Sports Illustrated 40th Anniversary Special: American Beauty, executive producer, 60-minute documentary, 2004. • Sports Illustrated Swimsuit Model Search, executive producer, 7-week, 30-minute reality show, 2005. • Guest/expert: Charlie Rose, GMA, Today, ESPN, PBS, NPR, CNN, Fox. • Night Trap, writer, best-seller, branching fiction video game, Digital Pictures, 1992. • ASME Editors Hall of Fame, 2012. • Arthur Ashe Humanitarian Award, 2008. • Unity Award for Courage, 2008. • Genesis Humanitarian Award, 2008. • President and Chairman of the Board, Paris Review Foundation. • Board of Overseers, Columbia Journalism Review.